In a 2008 article, Yosef Garfinkel and Saar Ganor claim that the story of David and Goliath contains a historical kernel of truth. For behind this legend, they claim, is an historical reality of tenth-century BC conflicts between Judahites and Philistines. The battle between David and Goliath is based in the border-area of the Valley of Elah, because that is where battles between Judah and Gath would have taken place. Perhaps the tale did have its origins in this period. But that’s not something we can probably ever know from a late Persian or Hellenistic story that exaggerates the fame of a now legendary King David by going so far as to claim that he slew a Giant while he was only a boy. Such a story certainly doesn’t provide historical corroboration of the Bible’s claims about an extensive empire, as Garfinkel and Ganor wish. The mighty Philistine city of Gath, ca. 30 hectares in area, was located only 12 km downstream from Khirbet Qeiyafa. This was a hostile border area, where the Kingdoms of Gath and Jerusalem had constant millenary [sic] conflicts. The story of David and Goliath is just one of the many “warrior tales” listed in 2 Sam 21:15-22 and 1 Ch 11:11-27. Even if many of these traditions are folkloristic in character, their chronology and geography bear historical memories. As by the end of the 9th century BCE Gath disappeared as a political power, these traditions must have been created at an earlier time. 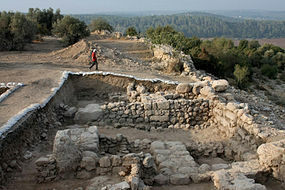 The biblical text, the single-phase city at Khirbet Qeiyafa, and the radiometric dates each stands alone as significant evidence clearly indicating that the biblical tradition does bear authentic geographical memories from the 10th century BCE Elah Valley. – Yosef Garfinkel and Saar Ganor, “Khirbet Qeiyafa: Sha’arayim”, Journal of Hebrew Scriptures 8.22 (2008): 6. Making straight forward connection between this site and the biblical tradition on the duel between David and Goliath takes archaeology back a century, to the days when archaeologists roamed the terrain with a Bible in one hand and a spade in the other. The story of David and Goliath is a complex one. There could have been an ancient memory on conflicts between Judah and Philistine Gath in this region and the story of the slaying of Goliath by a hero named David or Elhanan (2 Sam. 21:19) may be related to this ancient tradition. But the text in 1 Samuel 17 is Deuteronomistic in its language, and it seems to depict Homeric influence. It is clear therefore that the story could not have been put in writing before the late 7th century BCE. More than anything else the story portrays the theological goals of the authors and the historical reality of the time of the authors – centuries after the high days of Khirbet Qeiyafa. A final note on this issue: the eruption of the tradition biblical archaeology, characterized by a highly literal interpretation of the biblical text, should not come as a surprise. It is an unavoidable phase in the now two-centuries-long battle between the advocators of a critical history of ancient Israel and the supporters of a conservative approach that tells a basically biblically narrated history of ancient Israel in modern words. Following every high-tide of critical studies comes a “counter-revolution” of the conservative school. – Israel Finkelstein, “A Great United Monarchy? Archaeological and Historical Perspectives.” Pages 3-28 in R.G. Kratz and H. Spieckermann, eds., One God – One Cult – One Nation: Archaeological and Biblical Perspectives (Berlin, 2010), pp. 18-19. There have been some extraordinary claims for the significance of Khirbet Qeiyafa. But a little sensible reflection should lead us to conclude that the excavation of a tenth-century border city doesn’t really indicate that anything of historical value can be found in a story from half a millennium later about a Giant-slaying boy who later became king, let alone justify the conclusion that he reigned over a vast kingdom from Egypt to Babylon. [A] fortified city doth not a kingdom make. – Jonathan N. Tubb, “Editorial: Early Iron Age Judah in the light of Recent Discoveries at Khirbet Qeiyafa”, Palestine Exploration Quarterly 142.1 (2010): 1-2, p. 1. Garfinkel may well be right but on the other hand he may well be making a suit out of a button. I know this isn’t the point of your article, but do you happen to know what the Homeric connections in 1 Samuel 17 are? Finkelstein footnotes his earlier discussion about the connections between the description of Goliath’s armour and Hellenic (hoplite?) armour. More convincing to me is the genre of a duel between two heroes in front of their respective armies. First of all, evidence has been found linking the Philistines with the people who occupied the area of Troy at the time of its destruction, so we must consider the possibility that similarities between descriptions of the armor in I Samuel and the Iliad exist because they describe the same type of armor. Second of all, the role of single combat in the Iliad is not the same as it is in the I Samuel account, where Goliath presents it as a proxy for a full-scale battle between the armies. Single combat did not end the Iliad. Some would say that this difference of roles argues against a literary dependence of one upon the other. Again, the mere fact that both accounts involve a duel between champions can be explained by the fact that both involve members of the same culture. After all, it was the Philistine Goliath of Gath who made the challenge. Actually, that’s a good point that both accounts involve members of the same culture. Given the late, 4th- or 3rd-century BC development of MT 1 Sam 17, and its inclusion of the motif of Giant stature, we are probably dealing in the case of both Greek and Hebrew literature with a Hellen(ist)ic story-telling topos. And the presence of such a literary topos tends to corroborate the ties as literary. I think your distinction of duels in the Iliad from 1 Sam 17 is overwrought: in both narratives the duel is narrated centrally, while the armies hover somewhere in the background and participate only at the end. Each are unrealistic, and therefore most probably literary creations. Your point that there are similarities in culture from the Aegean to the Levant (and beyond) is of course correct, but applies to almost any ancient literature, and certainly to ties between Greeks and Judeans in the Persian Period. Of course we must consider the possibility of an historical determinant of the elements which are found in 1 Sam 17. I agree that we should remain open-minded – but in the manner of the food-pipe, with the capacity both for absorption and excreting.